Good Omens for a TV Show – All of My Issues! The television world has finally been lucky enough to get an adaptation of Neil Gaiman’s American Gods. By all accounts, this series was pretty successful. The acting and casting were great for the first season. The casting of Ian McShane as Mr. Wednesday couldn’t be more perfect. Good solid performances from every major character. It was also visually stunning. We are definitely eagerly awaiting season 2. So . . . What else could a fan of Neil Gaiman ask for? How about an adaptation of his first novel co-written with Terry Pratchett? 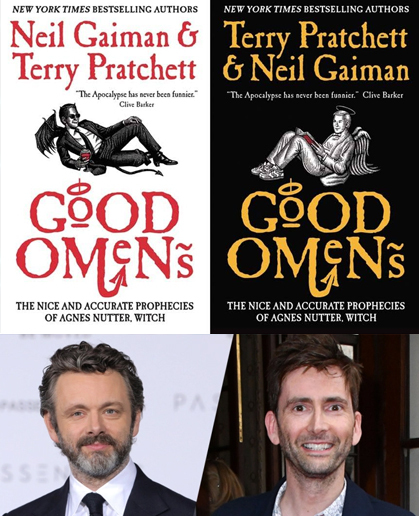 That novel would be none other than Good Omens: The Nice and Accurate Prophecies of Agnes Nutter, Witch. For those of you that haven’t read this book, you can think of it as a Hitchhiker’s Guide to the Galaxy for the Apocalypse. The End of Days has never been funnier. The basic premise of the novel is that a demon and angel are working together to prevent the end of the world. They have both grown fond of life on earth, and they don’t want it to end. Not much is known about the project at this time. It looks as though Neil Gaiman will have writing credits for episode 1. The most exciting thing so far, with the exception of the fact that this is actually being made, is the casting. David Tennant has been cast to play the demon, Crowley. The angel, Aziraphale, is being portrayed by Michael Sheen. Not sure you want to get excited about this yet? Just check out some of the remarks people have made on Twitter . . . If you can’t wait, or are simply interested in reading the novel, you can check it out at the link below. It is definitely an enjoyable read. We highly recommend checking it out. In fact, I may have to go and re-read it again now myself.